Google, Nebula Genomics, take notice of consumer calls for control over data. 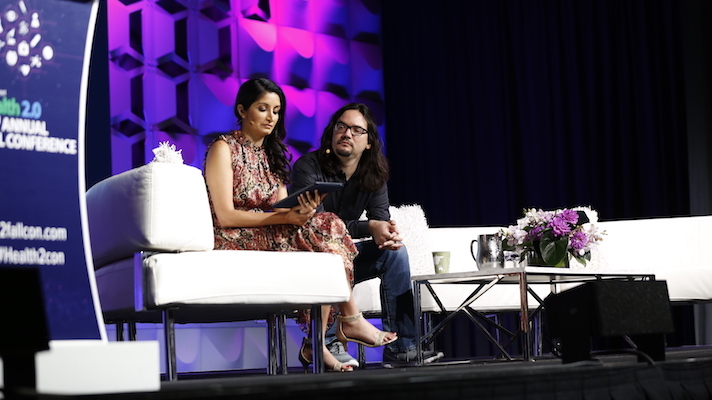 Indu Subaiya and Ricardo Prada chat on stage at Health 2.0's Fall Conference. Data privacy has long been a concern in healthcare, but the past year has seen consumers increasingly concerned about whether or not their devices are always listening. Speaking onstage at Health 2.0's Fall Conference this week in Santa Clara, California with Health 2.0 cofounder and EVP Indu Subaiya, Ricardo Prada, principal UX researcher at Google, said that his company is well aware of the public’s sentiment, both within healthcare and without. To address this, Prada said that his company has been looking into ways to separate its most advanced machine learning tech from the cloud. As an example, he described a consumer child and pet camera called Google Clips that only records when the subject enters its field of view. These clips are recorded in a closed system, meaning that they are never automatically loaded to a remote server, and only saved with the user’s permission. On day two of the conference, attendees’ concerns about data privacy were made clear when they voted Nebula Genomics the winner of the conference’s Launch! competition. Nebula is creating a blockchain-based platform that allows consumers to securely store their genetic data and selectively sell it to researchers. Just as consumers worry that devices they’ve bought to use as tools will also gather data from them, users of consumer genomics products have to worry about how that data is being used.